If you read our blog, you may have an understanding of how chillers work. These diverse and complex systems have come a long way in recent years and they are still developing today. One of the most fascinating developments in the world of chillers is one that has only come about in the past few years. LG Air Solution has implemented magnetic bearing technology to their chillers to greatly improve the efficiency and dependability of their products. You may be asking, ‘What are magnetic bearings?’ Don’t feel bad for not knowing. This dynamic technology hasn’t been on the market for long, but the potential applications could make it an essential part of many industries in the future. One of the main factors in the development of magnetic bearing technology can be attributed to Dr. Myounggyu Noh, a research fellow at Chungnam National University in South Korea. Dr. Noh was a driving force in collaborating with LG to develop and implement magnetic bearings into LG chillers. LG approached Dr. Noh in 2013 based on his expertise and experience in the field of magnetic bearing research and the rest is history. We had the opportunity to talk with Dr. Noh and hear his compelling story of how he was in the right place at the right time to help LG deliver this groundbreaking component solution. We’ll let Dr. Noh tell us his story and teach us about magnetic bearing technology along the way. I received my doctorate related to magnetic bearing technology from the University of Virginia in 1996 and began my career as a professor at Chungnam National University in 1999. Once I began my work, I carried out research in turbo molecular pumps, flywheel energy storage systems, magnetic levitation trains and other areas related to magnetic bearings. I was then able to find many opportunities for the implementation of magnetic bearing technology into various products with the data acquired through magnetic bearing research. When I first heard about the oil-free chiller project from LG, I had high hopes. So, I was really enthusiastic to face the challenges of applying this new technology along with a big name like LG. I was determined to use the technology I knew and produce great results. From an engineer’s perspective, of course research is important. However, I felt that having that research go into a product that contributed to people’s lives and society would be most satisfactory. I was very happy to be given that opportunity. Chillers are extremely complicated systems with a lot of components. One of those components is a compressor. In a chiller, the compressor compresses the refrigerant, and when that compressed refrigerant expands, it absorbs heat to create the cooling effect. Compressors rotate quickly, but bearings are needed to allow them to rotate. With ball bearings, friction causes wear, and because oil is required, the oil can mix with the refrigerant, which causes cohesion in the heat exchange mechanism. This can cause a issues with the performance of the heat exchanger. But I am involved in magnetic bearing research, which uses magnetic force to make the rotor of the compressor float in the air so that it rotates without direct contact with other components. Because the rotor rotates without contact, there is no wear due to friction, and since there is no oil needed, issues related to the use of oil can be resolved. Therefore, oil-free chillers have the benefits of higher efficiency and dependability. Magnetic bearings can also be controlled, and the signals needed to control the magnetic bearings can be used to monitor the system and predict issues with operation that might occur. Oil-free chillers really have the advantage of higher dependability over traditional chillers. 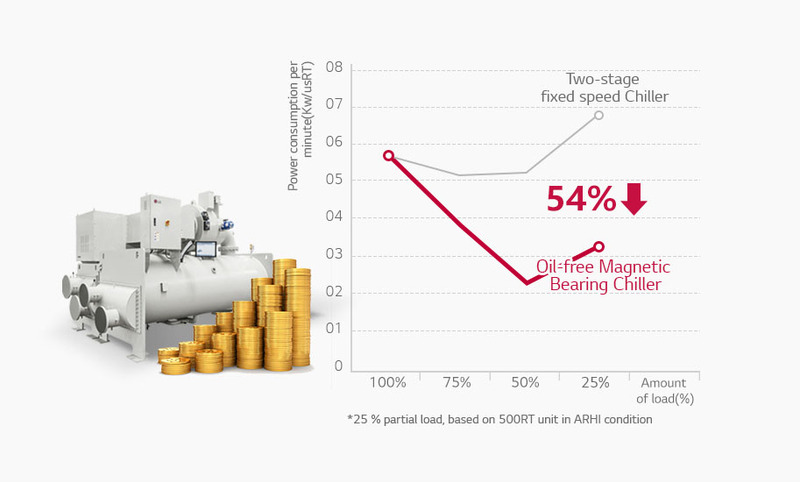 The various signals that come from the magnetic bearings used in oil-free chillers can be integrated with AI technology to predict faults in the chillers to provide advance notifications about the maintenance cycle or any other maintenance issues not scheduled in the system. Also, I think that there is a great potential for higher efficiency and economic feasibility with intelligent operation according to the cooling load of each system. Around May of 2016, we spent about a month testing the new product at our university. At that time, LG researchers came to the university and lived there for a month to perform tests with us. There were a lot of challenges that we faced at that time, but as we resolved each of those issues, we were very ecstatic about the results. I also have very fond memories of going to the restaurants in the vicinity and spending time together with our teams. We conducted the final test at a factory in Qingdao, China. I have many memories of checking the performance of the chiller and conducting tests in China as well. In order to design the controller for magnetic bearings, a lot of experience and time for tuning is required. In this process, the computer used to design the controller can run automatically to reduce the time needed and reduce the dependence on the experience of the engineers. So, the research being done now can be automated for the design of the controller. One of the goals of this magnetic bearing research is to be able to apply it in other fields besides chillers. Finally, another goal is to miniaturize magnetic bearing technology for application in smaller systems as well. We would like to thank Dr. Noh for his time and for sharing his story. He is an integral part of one of our most innovative solutions, and for that, we are extremely grateful. We hope you have enjoyed Dr. Noh’s story as much as we have. You will inevitably hear about magnetic bearings in the near future, and when you do, be sure to remember Dr. Noh and his work to bring this technology to the forefront of our industry. *Products and solutions may vary according to country and operating conditions. Please click the ‘CONTACT US’ button below to contact your local LG office for further information on solutions and products.